The Onondaga Commons Plaza is home to several local businesses on the Near Westside of Syracuse. 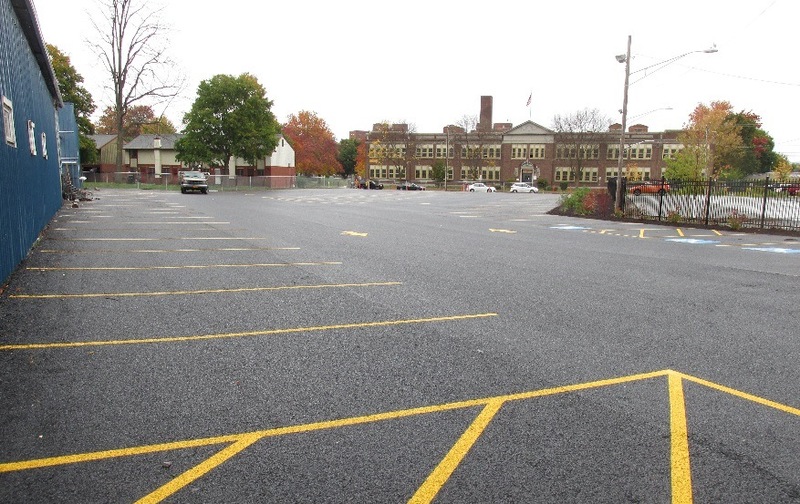 Onondaga Commons has partnered with the Onondaga County Save the Rain program on several stormwater management projects as part of a comprehensive redevelopment of approximately 4 acres of surface parking area across the commercial property. The collection of projects includes a diverse mix of green infrastructure elements to manage stormwater on-site. The Onondaga Commons Rural Metro project includes the installation of porous pavement in the new parking area in the rear of the building. The porous pavement will capture the parking lot area as well as half of the Rural Metro Building’s roof runoff (the remaining roof area was managed with the Rural Metro Phase 1). 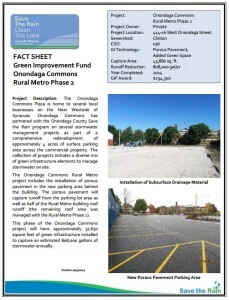 This phase of the Onondaga Commons project will have approximately 37,650 square feet of green infrastructure installed to capture an estimated 808,000 gallons of stormwater annually.